I love everything about this cake! It’s so delicious and easy to make. We calculated the price is about $3.68, so that’s a few dollars cheaper than the box mixes. My absolute FAVORITE cake ever. grease your pan(s) with shortening and sprinkle with cocoa powder. Add eggs, milk, oil, and vanilla and mix together. Mix on medium speed for 2 minutes. Turn the mixer on low and add the hot water, and mix for another minute. Pour batter into prepared pans. 2 – 9″ round pans, 30-35 minutes. 1 – 9×13 pan, 45 minutes. 24 cupcakes, 18-20 minutes. Use a tester to check the middle of the cake for doneness. Let the cake pans cool for 10 minutes and then turn them out on a wire cooling rack. 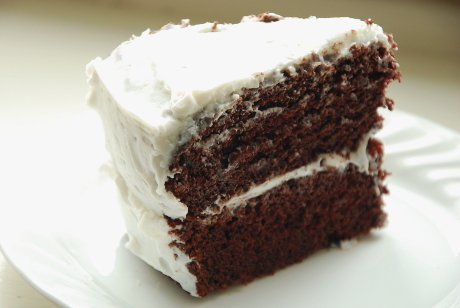 Once the cake is cooled, frost as desired. 2 Responses to "Gluten Free Dairy Free Chocolate Cake"
I have been enjoying looking through the recipes! I wonder how this would be with coconut flour? I will most likely try it out and see as we are trying to stay away from corn and white rice for the time being for some gut healing etc. Looks so yummy though and will do a trial run and maybe make it for Jade’s birthday coming up in a couple months! My only experience with coconut flour was at the support group when they made the same muffin recipe with about 20 different flours/blends. The one that was straight coconut was really dense, so it should have been modified with less flour or more liquids. I’m sure with some experimentation that it would work great! Maybe you could try the flour blend by substituting coconut flour for the rice flour, and add more of the other starches and leave out the corn starch.